The LEGO Dungeons & Dragons group on Facebook recently had a discussion about sorting and storing LEGO collections. I kept my comments on that thread fairly short, but then decided to expand upon them here. 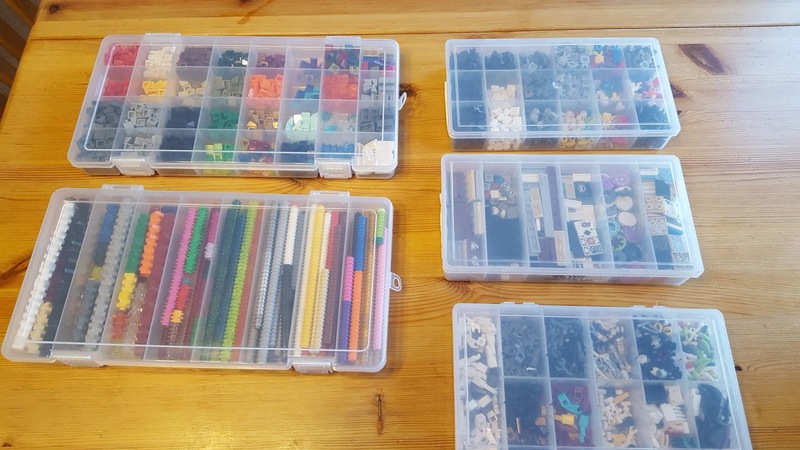 This column will give a quick overview of how I sort and store my LEGO collection, and how I transport LEGO miniatures with me to games. This is simply how I do it, and my priorities will continue to change over time, so simply take away whatever ideas you think will help you, and feel free to ignore the rest. My personal LEGO collection totals over 50,000 bricks. That's just the sets for which I have documented piece counts; that number doesn't include any of the sets from my early childhood for which I no longer have boxes or booklets to identify the set, or any of the loose bulk bricks that I've bought through Pick-A-Brick, grab bags, Bricklink, eBay, etc. To give you an idea how much space that takes up in my house, the 6' x 3' x 1' bookshelf in the photo below (left) holds most of the bricks that I'm not currently using in any projects: small tackle boxes of tiny and/or specialized parts on the top shelf; larger boxes of bulk bricks sorted by color on the next two shelves; minifigure parts and accessories on the shallow shelf below that; more bulk bricks; and boxes of random, rarely-used specialty parts on the bottom shelf. The 5' x 2' x 1' pantry cabinet above (right) holds tackle boxes with LEGO miniatures on the top two shelves. This is where I keep minifigures and minifigure-scale creatures sorted out by creature type and where I keep boxes of minis that I've prepared for games I'm running. 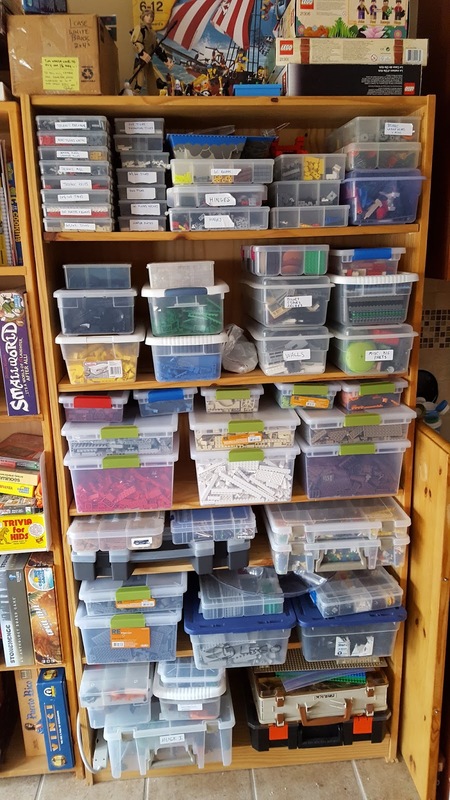 The bottom shelf holds LEGO Games and some additional minis, and the remaining shelf holds my and my wife's dice collections and random other gaming accessories. Wherever possible, I prefer boxes that have good, strong latches, to prevent lost pieces. Some of my older bulk boxes lack such closures, but the newer ones (like the Room Essentials boxes with green clips in the first photo) were bought specifically for them. I'm much pickier when it comes to the tackle boxes that I use to sort parts and minifigures. 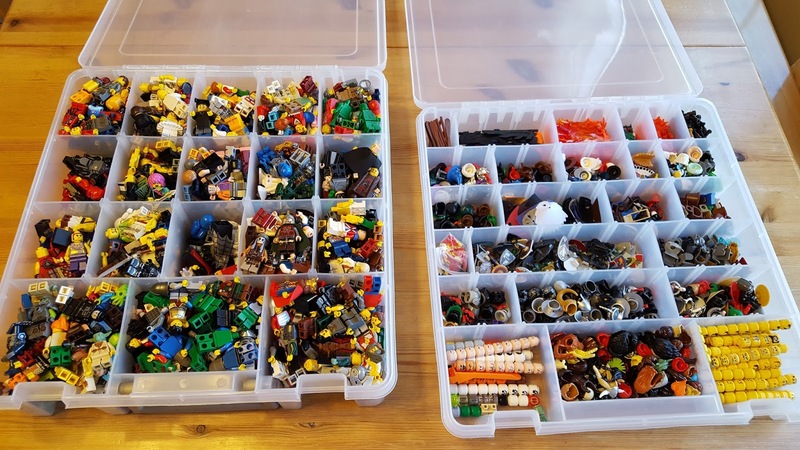 After all, if the lid isn't tight, then carefully sorted parts can drift into neighboring bins, as well as escape the box, and then you've lost pieces and labor. For my smallest parts, I use shallow tackle boxes with many compartments, like the ones below. The smaller boxes on the right have a very simple snap along the edge of the lid, but the ones on the left have actual latches. (Both kinds of box stack very nicely, as you can see above in the bookshelf photo.) I use these boxes for very tiny parts like 1x1 plates, 1x1 and 1x2 tiles, and 1x1 cheese slopes, as well as small specialized parts, such as printed tiles and Technic pins and axles, that I don't want to waste time digging around for in a box of bulk bricks. 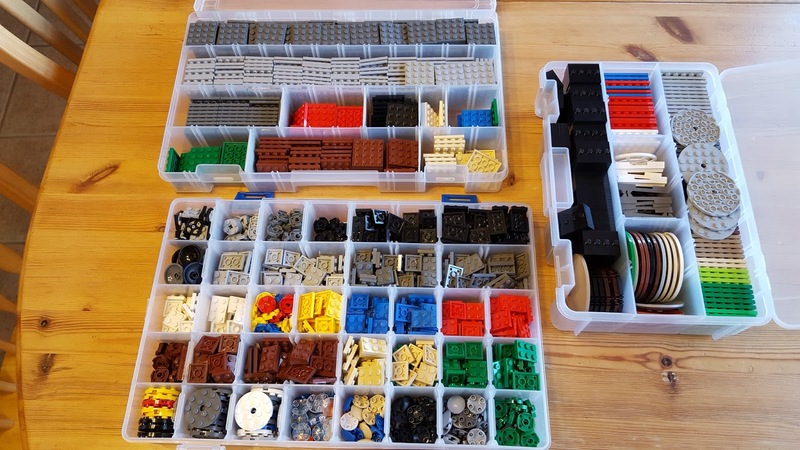 The boxes shown below are a bit larger and are used to sort larger pieces that I have in volume. These three hold the collection of bricks that I use as miniature bases: 2x2 and 2x3 plates for Small-Medium creatures (bottom), 4x4 plates (top), 6x6 plates and radar dishes for Large creatures and 8x8 radar dishes for Huge (right). 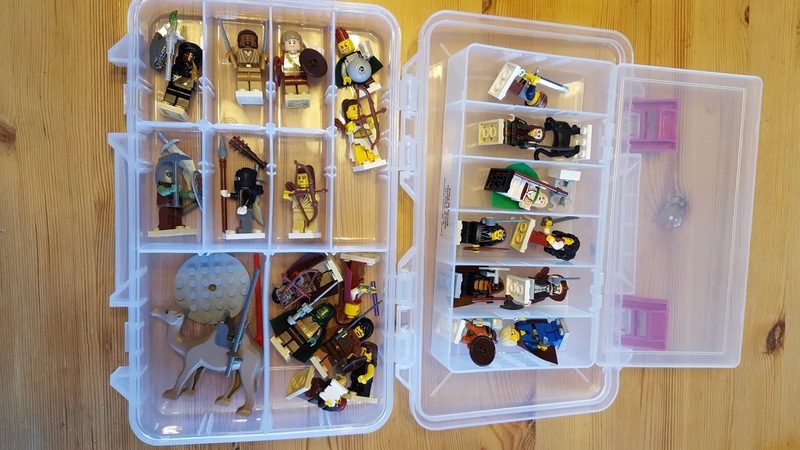 For minifigures that are not currently being used, I keep most of the bodies in a large divided ArtBin case (below left), with accessories and extra heads in a second, shallower case (below right). I recently had to separate out weapons into their own tackle box as well (not shown). The pantry cabinet holds a number of tackle boxes in which I have minifigures, and minifigure-scale monsters, sorted by creature type (animals, humanoids, undead, etc.) or by campaign. The photo below shows a few examples: small animals and vermin (including those often encountered in swarms, top left); other small animals (bottom left); larger animals (top right); and humanoids (bottom right). Both the size of the minis and the number of them I own will determine what size tackle box gets used. 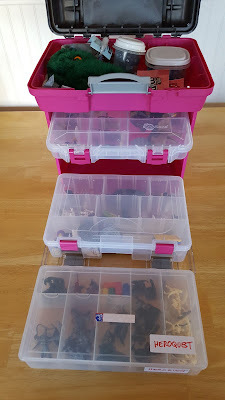 For an ongoing campaign (whether I run at home or elsewhere), I will use one of my smaller tackle boxes to hold the PCs' minis, and put any creatures that I need for upcoming sessions in a couple of larger ones. The photo below shows two examples: The small box on the right holds minis for the Lost Mine of Phandelver adventure that I've been running for my kids, as well as the PCs for the "Champions of Floris" game that I hope to resume with them someday. However, the latching on this style of box is not really secure enough for transporting it away from home, so I make sure to put a rubber band (or better yet, a hair elastic) around the box to keep it tightly shut. The larger box on the left holds the minis for my current "Time of the Tarrasque" campaign; it needs more space in order to hold the cavalier's camel. (The other minis are just some extra NPCs, for now.) I used this same box for my "Winds of Freeport" game, when I needed space for an elasmosaurus companion and an occasionally enlarged crocodile. This box has good latches, so doesn't need any extra binding for travel. The Creative Options carrying case shown at right holds one 1.5"-deep tackle box (like the Tarrasque party box above), plus two 2.5"-deep boxes, and has an undivided storage bin in the top. 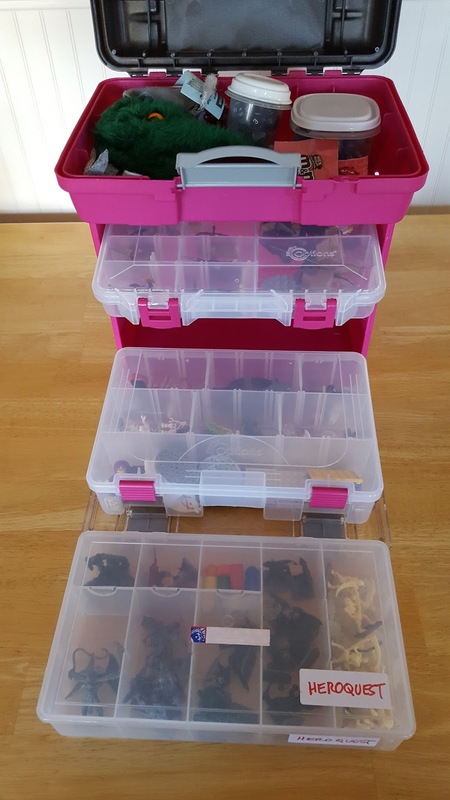 I typically use that top compartment for dice, scratch pads, snacks, and the occasional large mini that won't fit into any of the case's tackle boxes. If needed, it can hold an additional tackle box instead. 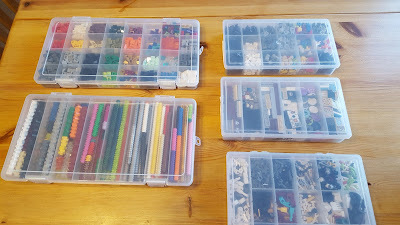 I have acquired a few extras of both sizes of Creative Options boxes so that I can easily swap them in and out of the case as needed. This was very handy when I was running my "Gorilla Island" adventure, because I had many more minis prepped for it than would fit in this one case. 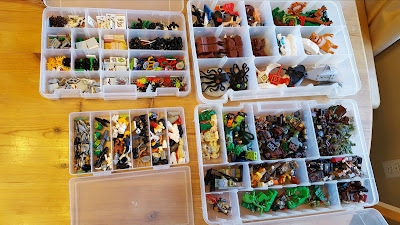 By organizing those minis by what sections of the island they would be needed for, I could easily grab the one, two, or three sets that would be needed for a given session. I typically acquire new tackle boxes at Michael's (check the bead aisle first) or the sporting goods section at department stores like Target or Wal-Mart (though you might need to search a while to find some that aren't sold full of fishing tackle). Larger storage boxes can be found in the home storage department of most large stores. In the past, I have also found useful storage containers at The Container Store, fabric stores, and art supply stores. Ironically, I have bought very few LEGO brand storage containers because, sadly, they rarely have sturdy latches and hinges, and never have the kind of movable dividers that I prefer. 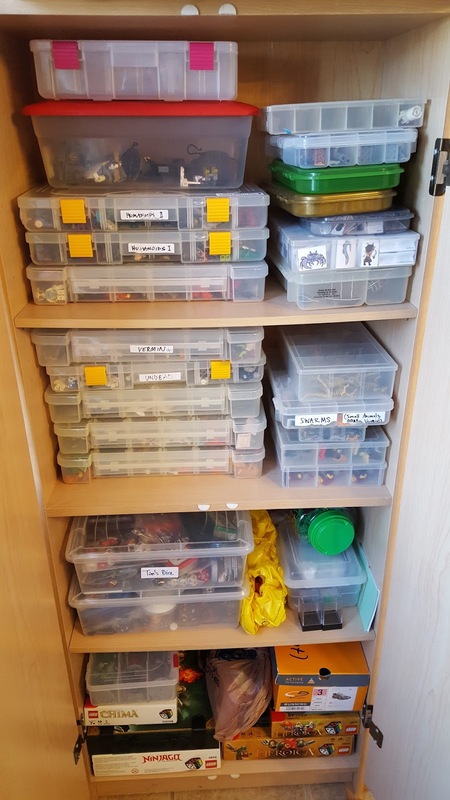 That concludes this brief tour of my LEGO collection and my storage habits. I hope this was helpful to anyone thinking about how to better organize their collection. As always, feedback in the comments is welcome!